The above info came from Kim N., and was edited by yours truly (contact me). The image came from photobucket. 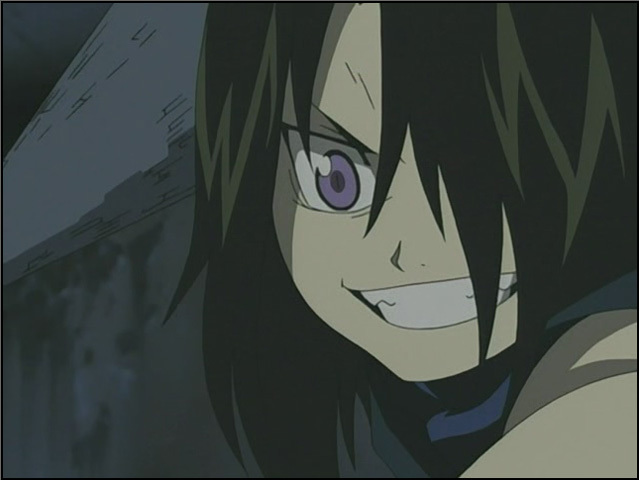 Wrath is another Homunculus who actually believed he was human for a while. He was found on Yok Island where the Elric brothers had to stay during some of their training. Wrath was instantly taken in by Izumi, who desperately tried to hide what he really was. Wrath, unlike most of the other Homunculi, can do alchemy. Wrath was created when Izumi attempted to revive her miscarried son. Wrath had been inside the Gate for a long time until Edward came by attempted to revive his mom (who later became Sloth), but instead lost his arm and leg saving Al. Wrath now has Ed's limbs in place of his own. Izumi rescues Wrath from the examining room during the South Headquarters assault. Wrath discovered his true nature thanks to Envy shortly after that. Envy had given some of the incomplete Philosopher's Stone to Wrath and manipulated him. Wrath is now desperate to get all of Ed's body, thinking he will become human. Wrath was a very sweet and innocent child at first. When he was transformed he become very aggressive and violent. Wrath also gets a bit psychotic whenever the issue of his mother is brought up. Wrath despises Izumi and truly thinks that Sloth is his mother. Wrath left without telling anyone where he was going. In the movie he shows up shortly after Izumi's death. Winry finds him while she is visiting Izumi's grave. Later he lives with Al and Winry for a while. When he learns about Al's quest to be reunited with his brother, he takes Al to the underground city and winds up fighting Gluttony and gets himself eaten. (A very gory scene.) Before he dies, he tells Al to transmute him to open the Gate so that Al can be reunited with Ed and Wrath can be reunited with the one he loves. Some believe this is Sloth, while others feel it is Izumi. The last moment we see Wrath, he is in his birthday suit calmly walking to his mother, Izumi, who greets him with a hug. He doesn't pull away from Izumi during his final moments, thus indicating that he has matured and it really is Izumi that he wanted to see. 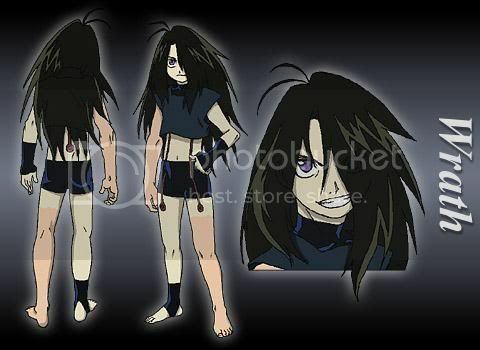 It appears that Wrath is also one of the very few Homunculi that can actually age, as he appears as a teenager in the movie. The above description came from Kim N., and was edited by yours truly (contact me). The image came from Devil's Nest.